People are always asking me “How do you restore plastic headlight lenses” or “What do you use to restore headlights”. I have a hard time answering because its not really something I can just tell them in a few words. 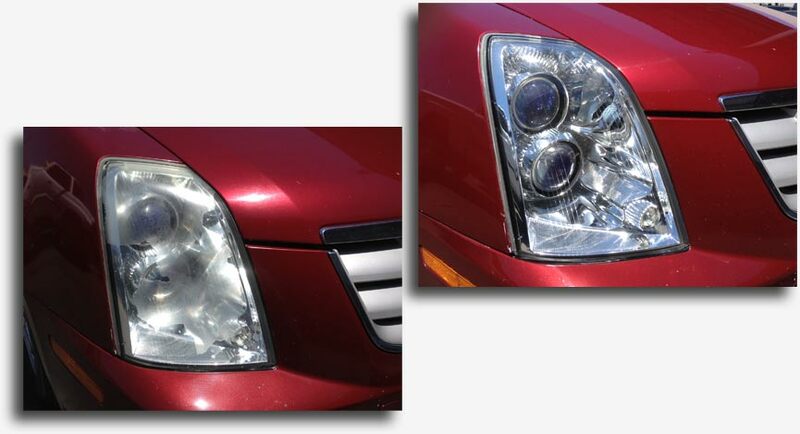 For the consumer there are a number of DIY kits on the market specifically for restoring headlights that you can try. What I use isn’t available to the general public. The reality is that if you want it done right and you want it to last, you are much better off if you just call a professional. I have been restoring headlights exclusively since 2002 and I don’t mind telling you that I’m pretty good at it. Something I believe to be true is that restoring headlights isn’t something you will be able to do like a pro the first time out. Companies who sell these DIY kits believe this too. They know the maximum amount they can charge you for their kits so that you won’t return them for a refund. They also believe that you are more likely to blame yourself for it not working. This is sad but it’s true. So in this article, I’m going to try to explain the process of restoring your headlights by giving you some dos and don’ts. This will probably help you more than me trying to explain what I use and how since these products aren’t available to consumers. You won’t find anything I use at the hardware store, paint store, detailer supply store or auto parts store. Substituting similar tools or products won’t give you similar results. With that said, let’s get started. Ok, back to the article… First let me start out by saying that doing something, whether or not it turns out perfect, is better than doing nothing. This is a safety issue so you run the risk of getting a fix-it ticket in all 50 states if you let it go. A word to the wise… Be nice to the men and women in blue and you will be less likely to get written up for yellow headlights. If the damage is barely noticeable, I mean if it’s so slight that only the pickiest of car owners would ever notice, go ahead and try toothpaste. Apply liberally to an old washcloth and work it into a small area using a circular motion. You will need to use some elbow grease if you want to achieve any results. Toothpaste has a mild enough abrasive in it that you are not likely to do any damage. Rinse with water after you have finished going over the whole headlight. Dry with a soft cloth and inspect your work. Repeat if necessary. If that doesn’t do the job then the damage was probably too severe. Don’t bother trying anything more aggressive just yet. You don’t want to do something that can’t be undone; headlights are way too expensive to risk that. For now just enjoy your headlights’ minty fresh smell and move on to 2. Buy a kit from your local auto parts store. 3M makes one that is the closest to what I use in principle compared to the rest of them. Follow the directions! These kits are not for the faint at heart. You will be doing what seems to be irreversible damage but you need to have trust in the process. Use plenty of water to avoid plastic from building up on the abrasive disc. This is the proper way to work with plastic. Basically the process involves making finer and finer scratches. The polishing step will take out the really, really fine scratches left by the last sanding step. I don’t endorse the use of their polish because it has the potential for doing harm. But that’s what you have to work with so what are you going to do. Call a pro. It’s not that expensive and the quality repair will last a couple years more or less depending on your use. There are some significant differences in the products I use that make my process superior. Unfortunately, like I said before, they aren’t available to the general public. They are industrial products available only to LensDoctor® Certified Dealers and optical labs. The main differences are in the design and abrasive content of both the wet / dry sanding discs and the cut / color polish. Both use a soft abrasive composed of aluminum oxide. The disc is a unique shape for several reasons. The equipment used is designed to work with these specialized abrasives. Substitutions won’t yield the same superior results. Don’t use anything designed to polish painted surfaces! They cause crazing and contain chemicals that cause cancer. Well, that’s about all there is to it. I hope this clears up some questions you may have had. Don’t forget to leave a comment and happy polishing! People are always asking me “How do you restore plastic headlight lenses” or “What do you use to restore headlights”. I have a hard time answering because its not really something I can just tell them in a few words.